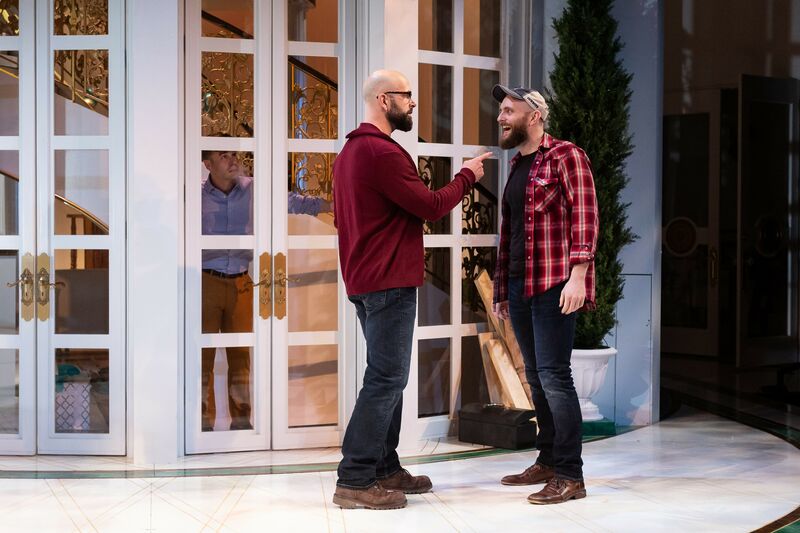 The Alley's fifth production of a Theresa Rebeck play proves one too many for our valiant critic. 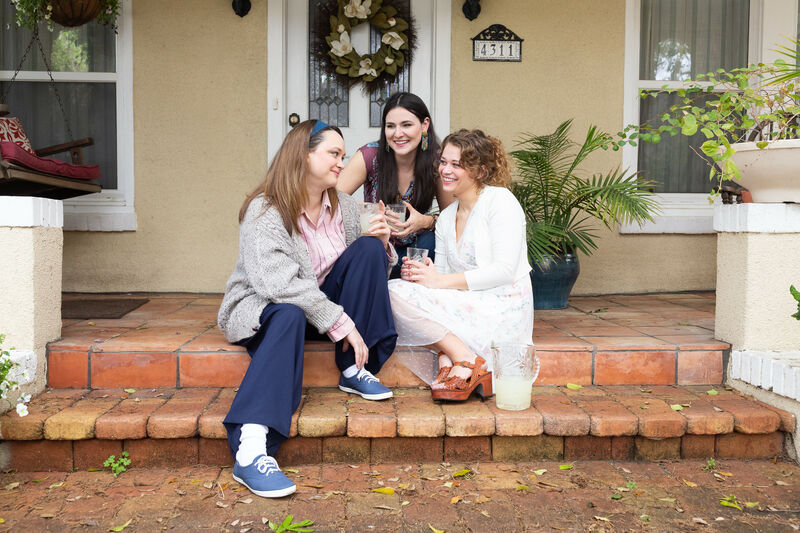 (Left to Right) Elizabeth Bunch as Joss, Carine Montbertrand as Lizabeth and Jeremy Webb as Stuart in the Alley Theatre’s world premiere production of Fool. On his deathbed, Edmund Kean—perhaps the nineteenth century’s greatest Shakespearean actor—uttered one of the most famous maxims in the history of the theater: Death is easy, comedy is hard. 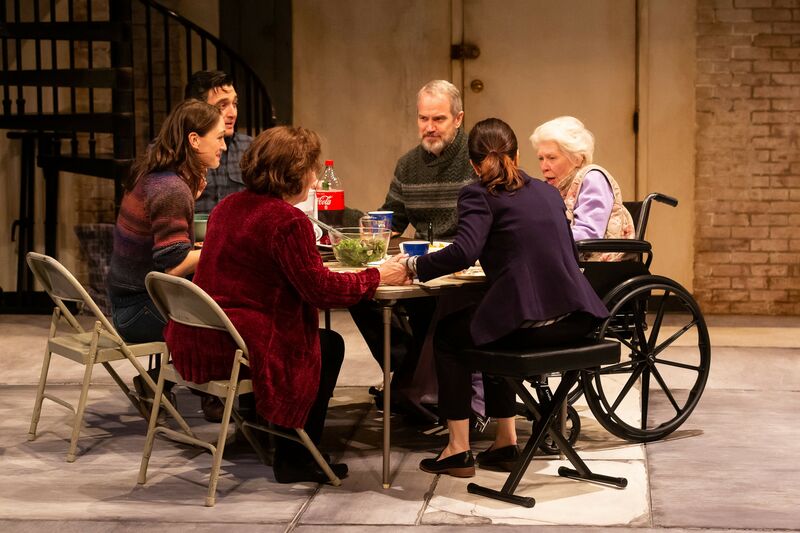 He then coughed painfully, closed his eyes, and in a voice so weak he could barely be heard, added: And a Theresa Rebeck comedy is like dying a hard death. 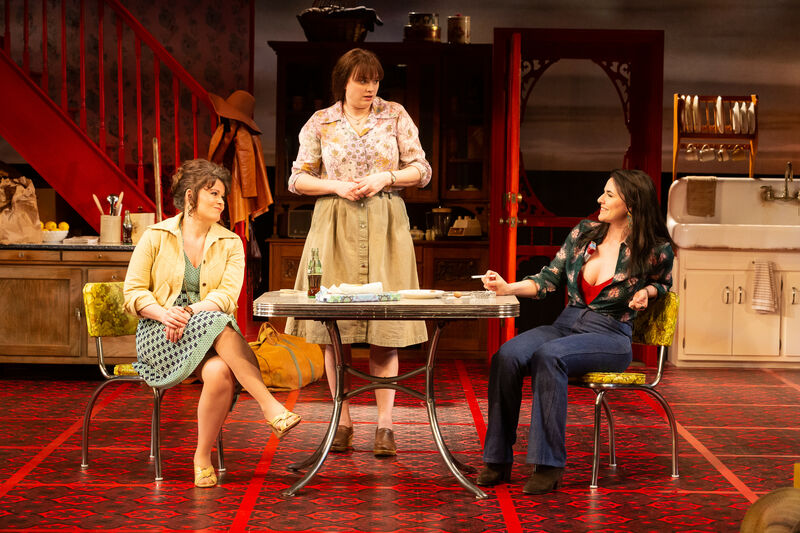 We had always considered this the cheapest of the great thespian’s cheap shots, but that was before we attended the world premiere of Ms. Rebeck’s play Fool at the Alley Theatre. Bolting from the auditorium at play’s end, streaking across the painfully worn, heavily stained red carpet on the Alley’s mezzanine, and tumbling down its grand staircase past flags trumpeting the theater’s upcoming $46.5 million renovation (“NEW EXPANDED MEN’S RESTROOMS”), we could not decide whether Kean had been prescient or charitable. To an extent, we shouldn’t have been surprised at our hysteria. We had scanned the press release, after all, and cringed to discover that Fool was “a dramatical comical farcical tragical play,” but even then we were willing to give the play the benefit of the doubt and throw in a few commas besides. 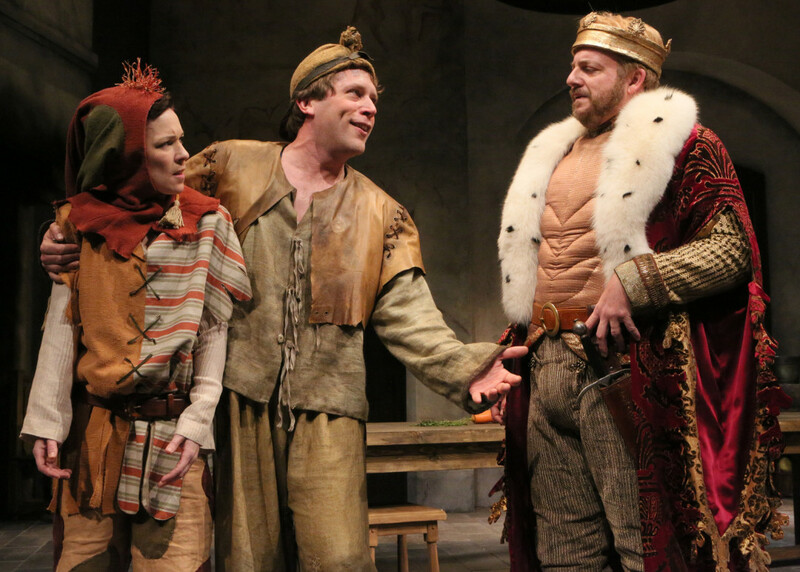 Of course, the release, not content to reference every theatrical genre, had also added that the playwright’s DCFT mash-up was “about power, love and laughter,” which had raised our threat level to orange, and that it was “set in a medieval kitchen,” which moved it from orange to red. But we kept calm and carried on. At rise, two court jesters (Jeremy Webb and Elizabeth Bunch, the latter miscast) from two different kingdoms were in the midst of a competition, one in which the least funny of the two would be beheaded. We noticed that each had donned the requisite drag (jingle-bell cap, mock scepter, breeches with different color legs) and smiled as they did their stand-up bits offstage in a banquet hall, after which they returned to the aforementioned medieval kitchen to compare notes and argue about who was funnier, a dispute that was periodically mediated by a kitchen maid (Carine Montbertrand). It occurred to us that Fool’s premise would not have been out of place on Saturday Night Live, which is to say a place where sketch comedy is encouraged to be aggressively unfunny, sometimes embarrassingly so. But at least the long-running NBC series has the good sense to go to a commercial after the five minutes it takes to wring all the laughs out of such an idea. Not so Rebeck, who ran the meter for five and then proceeded to hold her audience hostage for 90 more. As the evening wore on, there were indeed moments when the play threatened to catch fire and achieve a certain zaniness, and in every case Rebeck’s jokes proved a remarkably effective flame retardant. We felt sympathy for the audience, working mightily to appreciate this twaddle and pretend that cross-dressing and fart jokes and lispy courtiers really were as funny as the playwright seems to believe. In a way, Rebeck is right. Fool really is about powerful institutions and the abuses to which they are liable. But you won’t get that from the jesters or the wench or the king who looks like he stepped out of an old Imperial margarine commercial. You’ll get it from the Alley itself, which eschews the whole idea of democracy with every play it mounts by Queen Theresa.